Are you bored, and do you have some basic knowledge about blender? Try the Unofficial Blender Riddle. It’s a riddle like not pron and currently has 11 levels, but more are on the way. The reason why I’m releasing it now is to get feedback on the level of difficulty. So go play, and tell me what you think of it. Too easy, too difficult? Edit: Currently there are 31 levels. If you wish you can take a shortcut to level 21. Cool - I’ll get to it at some stage! Took a bit of searching, more blender history than basic blender knowledge though, and some answers are not about blender. I quit on puzzle 10, it doesn’t make any sense to me, but after going through notpr0n and frvade, I’m sure I’ll figure something out about it later. You might want to hide some minor clues or jokes in the source and alt-text of the pictures too, some of the pictures are difficult to decipher. Well, maybe not the source, for such a simple page it was very difficult to parse the enormous amount of text. >>edit: I see you changed the text in the 2nd/3rd? level already from “Monkey Power!” to another tip…I won’t spoil it though. It’s a nice start, keep up the good work. There are indeed some more difficult ones among them. Hiding some clues in the alt-text is a good idea, as googlepages doesn’t allow to hide things in the source code with html-comments. I’ll also make sure to make more riddles based on blender knowledge, instead of blender history. Thanks for the feedback. Felix_Kütt: what doesn’t work? Did you get the part that you have to change the url manually? What other monkey? I don’t get the second one. Maybe I’m just stupid. I guess its something that you either get or you dont. I cant do the first one, but i dont know whether i have to think laterally, cryptically, literally or like a TMNT, so yeah, its an annoying game at the mo. Edit:- helps when you spell things correctly, now i’m on level two. Hard not to give away, but there is a second monkey in Blender lore. I’d like some help on level 3, it means nothing to me. And will drive me insane until I know what it is. 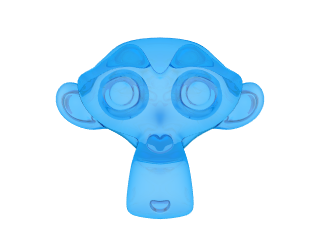 When i do a bit of digging i find doezens of monkey characters that have been created in blender. I found nothing amongst Sago cartoons that worked either. Those of you who had trouble, I PM’ed you each a hint, hopefully it doesn’t give it away, but helps you on your way. Now somebody help me with level 10, heheh. >>edit - nevermind, I got it, but it doesn’t make much sense to me given the clue, I just feel like I guessed lucky. crouch: This is fun. I’m stuck on 6. Zazu, bgstratt just helped me out on that one. It’s nothing in the program, it’s something about Blender history.